Learning to move in the right manner is the very first and the most important thing you need to learn when it comes to exercising. For every activity, be it biking, riding, cycling or even walking, coordinating your arms and legs is something that needs to be mastered. The better you coordinate, the more efficient you are in any given exercise or activity. Just like activities such as cycling or biking have a movement philosophy of their own, swimming, too, requires effective movement that is different from the kind of movement, necessitated by other activities. How is Arm Coordination Different in Swimming? Ever wondered how a person with a not so good physique or figure ends up being a faster swimmer than one with a great body? This is because when it comes to swimming, you are not just required to learn to move your arms faster but move them following certain techniques. The major difference in movement between running, cycling and swimming is the application of the leverage. In cycling or biking, you keep in touch with the ground, which allows your body to go forward with the base kept firmly on the ground. The turnover of your legs, too, can stay high and you can constantly push forward without the risk of losing your balance. In swimming, there is no concept of leverage simply because your body is not placed anywhere. Swimmers need to create their own leverage with effective use of their arms and leg muscles. Simply moving the arms fast is not enough in swimming. Swimmers, especially beginners, often focus on moving their arms as fast as possible, resulting in a “windmill” type of stroke, which is a strict no-no. 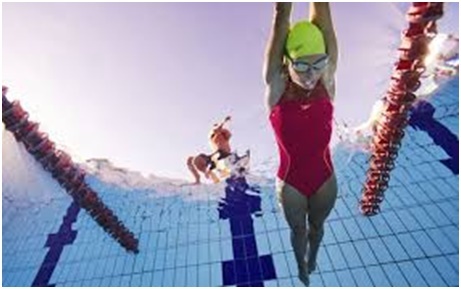 In this type of stroke, the swimmer’s arms move in a circular pattern at a very high speed. As such, it becomes even more difficult for him to place the arms in positions that create the best-possible leverage against the water. Further, the windmill stroke compels your hips to lose balance, consumes more energy and also leads to repetitive motion injuries in the shoulders and elbows. While experts at the Midlothian Swimming club can help you avoid this stroke and learn the right ones, here is a tip to understand if you are performing the wrong technique. Swim fast in a group and see if your arm coordinates with one another. If it doesn’t then you are probably following the windmill stroke technique. The Coordinated Freestyle technique is the best form of arm coordination in swimming. It typically allows your stroking arm to move into a vertical position in front of your shoulder while your recovering arm just enters the water. The swimmer can take a brief pause and extend forward for regaining the coordinated position. The best thing about this movement is that it saves a lot of your energy and creates a foundation for a strong leverage. So, train yourself on the best techniques and set about being an expert in the field.